Things I'm cooking and food products and places I like. I’ve always loved asparagus season in Central California. I like that it’s a finite season, and it’s an agro-culinary treat you can really look forward to. Resisting the urge to buy those nice looking spears that come from Mexico a month or so before the California season begins, I patiently wait for the local product to finally arrive. I’ve been enjoying this year’s crop in the usually ways: grilled, sauteed, broiled, in salads, etc. , but wanted to create a recipe that included some of my other favorite flavors. While asparagus has a distinctive flavor, it lends itself well to a variety of cuisines and applications. 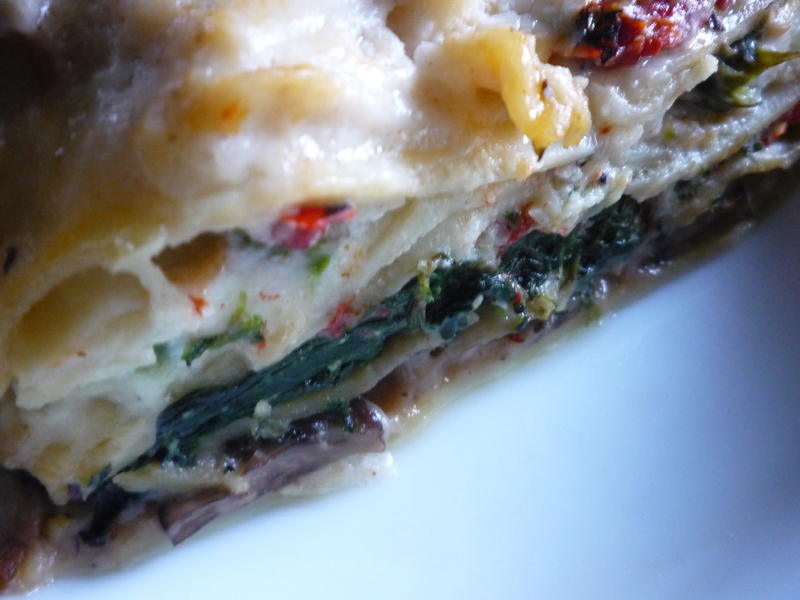 This recipe for lasagne has lots of steps, but isn’t difficult to make. Enjoy! Cook lasagne according to package instructions. Cool and set aside. Melt butter in medium sauce pan over medium heat. Add onions and sauté until soft and butter is just beginning to brown. Reduce heat to low and add flour. Stir with a rubber spatula to combine and break up any lumps. Continue cooking, stirring frequently, for 2-3 minutes. Slowly add milk while stirring constantly to prevent lumps from forming. Add salt and pepper and stir frequently until mixture is thick. Remove from heat and set aside. Bring a medium saucepan of salted water to a boil. Trim tough ends from asparagus. Add asparagus to water and cook just until crisp/tender—about 3 minutes. Drain and immediately dunk in ice water to stop cooking. Drain again and set aside. Cut mushrooms into wide, chunky slices—about 3 slices per mushrooms for medium-sized caps. Add olive oil and butter to a sauté pan over medium-high heat. Add mushrooms and salt. Sauté for 5-7 minutes or until mushrooms have softened and released their juices. Add pepper and thyme and cook one more minute. Remove from pan and set aside. Wipe out pan and add 1 Tblspn olive oil to pan over medium-high heat. Add spinach and sauté until just wilted, but still bright green in color. Remove from pan and set aside. In a medium bowl, combine ricotta, goat cheese, egg, zest, basil, salt and pepper. 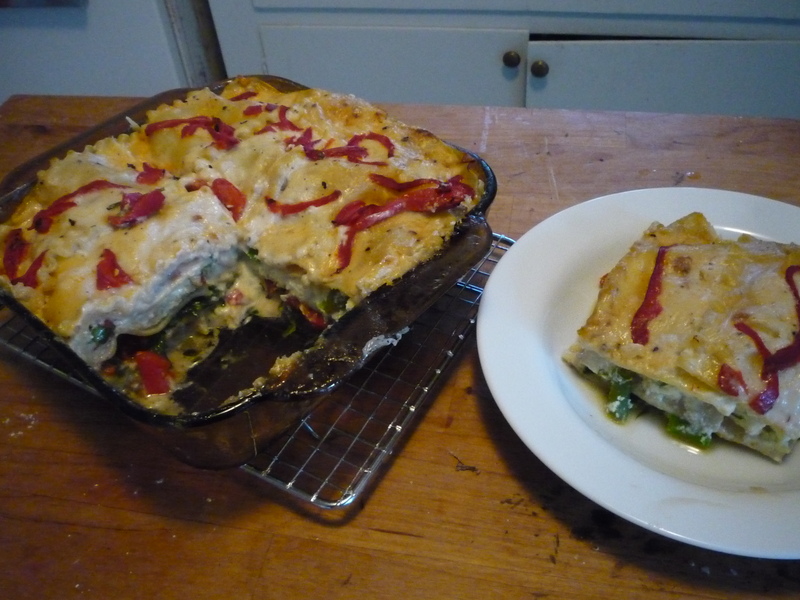 For lasagne assembly, spray a 9” square baking dish with cooking spray. Place a layer of noodles in the bottom of the pan. Top with about 2/3 of the béchamel sauce. Add mushrooms in an even layer. Add another layer of noodles and top with sautéed spinach and about 2/3 of the piquillo peppers. Add another layer of noodles and top with 2/3 of the ricotta mixture. Lay in the blanched asparagus spears in an even layer and top with remaining ricotta mixture. Add another layer of noodles and top with remaining béchamel sauce and piquillo peppers. Cover with foil and bake in a pre-heated 350° oven for 30-40 minutes or until heated through and bubbly. Allow to cool for 10 minutes before cutting and serving. 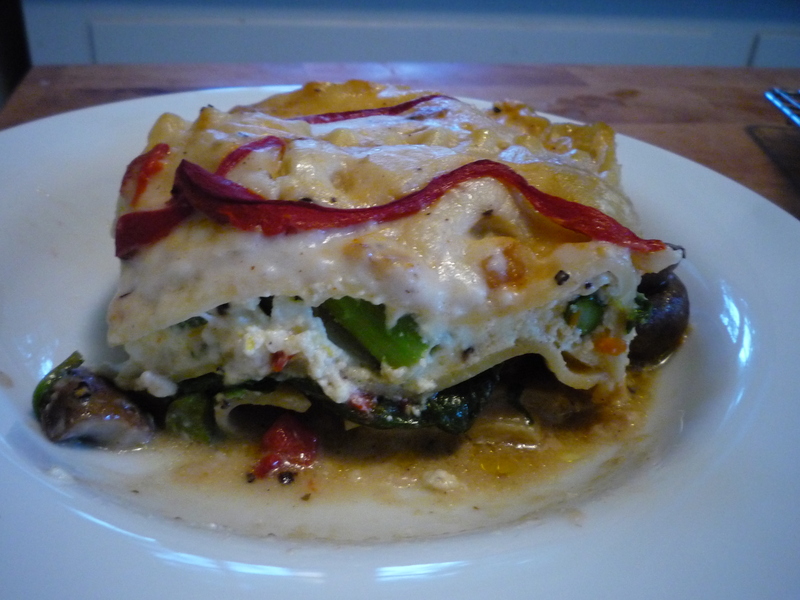 Posted on July 7, 2013, in comfort food, food, main dish, recipes and tagged asparagus, comfort food, food, goat cheese, lasagne, recipes, vegetarian. Bookmark the permalink. Leave a comment.